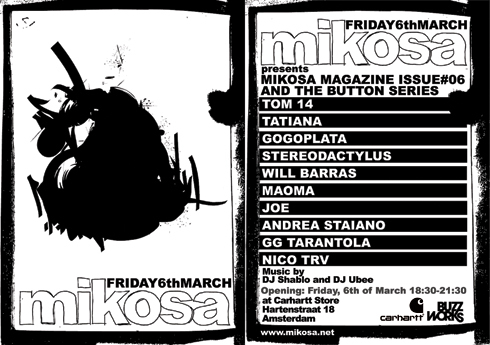 The release of the new Mikosa will be celebrated at Carhartt Store Amsterdam. The actual issue can be seen as prints in frames, each print by one of the participating artists as well as the individual gadgets. Besides the expo around the current issue, there’ll be all former issues, silkscreen prints, stickers and info about the mural they did. March, 6th / 6:30 p.m.